Beko is taking on a global mission to help prevent childhood obesity via its Eat Like a Pro initiative and today, the leading home appliances brand is delighted to announce an exciting partnership with UNICEF and existing sponsorship partner, FC Barcelona and it’s Foundation, to raise €1,000,000 for the cause. Beko will not only inspire and raise awareness about the global challenge of obesity in childhood, but has a goal to raise €1,000,000 for UNICEF by encouraging people all over the world to share their healthy eating habits on social media. For each #EatLikeAPro post that appears on Instagram or Twitter, Beko will donate €1 for UNICEF. The donation will help children worldwide through various UNICEF programmes, ultimately striving to prevent child malnutrition, in all its forms, including overweight and obesity in children globally. FC Barcelona and Barça Foundation are joining this campaign not only because two of their partners start working together, but also cause the promotion of healthy habits is a central component in Barça Foundation programs. If current trends persist, by the year 2025, there will be over 70million children in the world suffering from overweight or obesity and Beko wants to change this by raising awareness and supporting a worldwide movement to help children eat healthier. 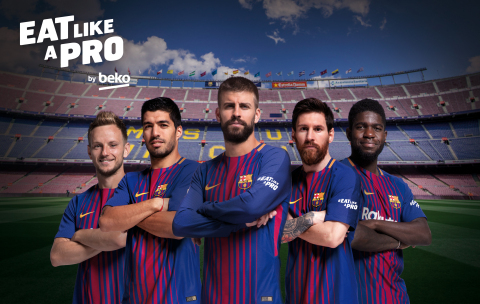 In support of the donation activity, during El Clásico, 6th May – the most watched domestic club match in the world – Beko will give up brand visibility on the players sleeve to highlight its healthy eating initiative, Eat Like A Pro. The FCB team will unveil its new kit on the day, celebrating the campaign by proudly wearing their sleeves dedicated to the initiative, #EatLikeAPro. The all-star team is inspirational to millions of children around the world and, as heroes for so many young people, will help to encourage children to eat healthier and look after themselves through a balanced and nutritious diet and physical exercise. The mission and campaign, Eat Like A Pro, aims to grant families access to the eating habits of the team’s finest players educating parents and children from around the world about the importance of a healthy diet and a balanced lifestyle. With its global presence, UNICEF will strive to eliminate hunger, achieve food security and improve nutrition in children on a global scale. UNICEF promotes the rights and the well-being of every child, with a special focus on reaching the most vulnerable and disadvantaged. The funds raised will help improve the quality of children’s diets and reduce the rising childhood obesity rates. Those sharing their healthy eating posts on social will also have a chance to win a limited edition signed FC Barcelona training and match day shirts, featuring #EatLikeAPro from El Clasico week. Barça Foundation will be supporting this campaign through its media channels, promoting the participation among their more than five million of followers around the world. This specific contribution by Beko, will support UNICEF nutrition programmes in Latin America, where an estimated 23% of school-age children are overweight or obese. This epidemic is increasingly affecting the poorer families and children and UNICEF, with the support of Beko and FCB, wants to change this. Beko’s aim is simple: to help prevent childhood obesity through awareness raising and education. In partnership with Beko, UNICEF will implement a programme designed to improve the eating habits of 600,000 primary school-age children in Latin America. The initiative is designed to provide the necessary education and support about the importance of healthy eating at home and in schools for children’s healthy growth and development. Beko is number 1 brand in the European free-standing white goods market and the second largest home appliances brand in Europe (Dec, 2017). It has been the fastest growing brand in the overall European market in since 2000. Beko is the international home appliance brand of Arçelik and a Premium Partner of FC Barcelona. FC Barcelona was founded 118 years ago in 1899, and is unique in many ways. The club is owned by its more than 145,000 members and can boast of being the most successful club in Europe over the last ten years. In that time they have won four of the Club’s five Champions League titles and seven of their 24 domestic league titles. Due to its very special personality, ‘Barça’ is recognized as being ‘more than a club.’ The team’s distinctive style of play is projected around the world by the best players and coaches of their time in combination with club’s famous reliance on homegrown talent. All of this goes hand in hand with its ongoing ambition to become the most admired, beloved and global sports institution on the planet. This mission is supported by such core principles as humility, effort, ambition, respect and team-work, while the club is also famed for its commitment to society, which is channeled through the FC Barcelona Foundation and its work to educate children through the positive values of sport. Such unstoppable growth in recent years has led to a global reach of more than 300 million fans and made FC Barcelona a world leader on social media. About UNICEF: UNICEF works in some of the world’s toughest places, to reach the world’s most disadvantaged children. Across 190 countries and territories, we work for every child, everywhere, to build a better world for everyone. For more information about UNICEF and its work for children, visit www.unicef.org.